Did you ever wonder what happens behind the scenes of your favorite theatrical performances? 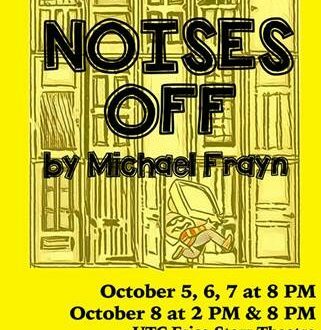 “Noises Off” just may provide an answer to that with a comedic look at the eccentricities and outlandish happenings going on behind the curtain. 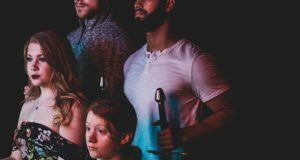 The Sam Houston State University Department of Theatre and Musical Theatre will present the playWednesday through Saturday (Oct. 5-8), with performances at 8 p.m. each day and a 2 p.m. Saturday matinee, in the University Theatre Center’s Erica Starr Theatre. A play-within-a-play, “Noises Off” bursts with bold, energetic slapstick style comedy. Senior theatre major Morgan Spann plays the role of Dotty Otley, a seasoned actress performing in the play “Nothing On.” “A play-within-a-play sounds like you have to learn a lot, but, actually, once we learn the first act most of the dialogue is the same, and the third act is just the first act with a little different spin on it,” Spann said. “Noises Off” provides an even higher degree of complexity in the second act, driven almost completely by body language and containing very little dialogue to drive the story and convey the characters’ dynamics. The actors use a Charlie Chaplin-esque style to convey emotion and comedy. The making of the play is so unique that it has inspired a docuseries, called “Behind the Farce,” by SHSU film major Khoi Nguyen. The docuseries, being released in installments online over the course of the play’s production, follows the cast from auditions to final curtain call. Tickets are $12 for general admission and $10 for students and senior citizens; they are available online through the Gaertner Performing Arts Center Box Office at shsu.edu/boxoffice or call 936-294-2339.